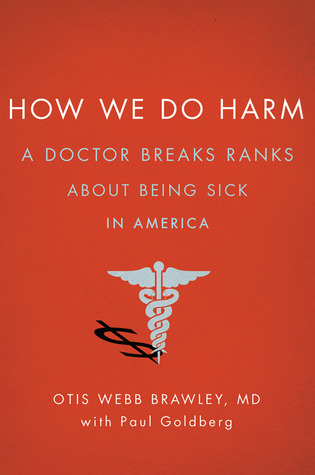 I recently finished a book by Otis Brawley entitled How We Do Harm (referring to health care) published in 2012. Dr Brawley, an Oncologist in Georgia, has done a very interesting job highlighting the effects of the evolution of medicine to the point where we harm patients as often as we benefit them. He is unsparing and blunt in his criticisms, the book dripping with his self-righteousness, but the sad thing is he’s right on. It is obviously easier to tolerate and accept such piety when you agree with it to begin with, but hopefully those who read it will be open-minded enough to accept his personal anecdotes and representative statistics of health care’s true ills. He condemns the business of medicine, the ignorance (apathy?) by physicians and systems regarding evidence-based medicine, and the selfishness that pervades the medical profession today. Part of this is the attitude of an aging physician lamenting the good ol’ days, though much of his vehemence is directed at physicians of his own generation. The “eat what you kill” philosophy of private practices has morphed to the point where killing often becomes all too literal. And many young physicians come into the profession not knowing anything else. One main problem in the book is that the author focuses mostly on the field of Oncology (not surprisingly as he is an Oncologist), but myriad examples exist outside of that field as well. Every specialty and hospital department has its whispered stories of excess and over or under treatment, but it has gotten to the point where those experiences seem to outweigh the good. In many ways a changing cultural and economic landscape and expectation has driven these less-than-ideal behaviors among physicians and health systems, though Dr Brawley does not spare the personal responsibility inherent in the medical system’s conduct. Is it too scathing, too much blame placed on individual physicians acting in their own self-interest? Possibly. But the points and examples he brings up of physicians ignoring medical evidence, either willfully or through intentional ignorance, to pad their own pockets cannot and should not be ignored. He is right on when he says that the health care “system” gets the exact results that it is structured to get. 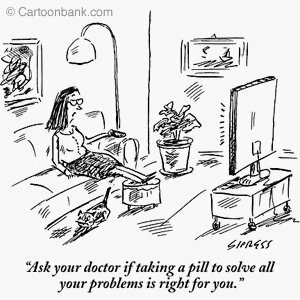 “’First, free screening provides free good publicity for the health system. People really feel good about us, because this is a community service. It will cause women to come to our women’s center and men to come to our chest-pain center. It increases almost all our product lines. It’s cheap, effective advertising. “’For every thousand men over age fifty who volunteer for free screenings, one hundred and forty-five will have an abnormal screen. Given the demography of the mall, ten of the one hundred and forty-five will have insurance that our health system doesn’t take. So, one hundred and thirty-five will come to us to see why they have an abnormal screen. We make up the cost of offering free screening by charging for evaluation of the abnormal screens. About forty to forty-five will have cancer. We hit bingo with them. We know the number who will get radical prostatectomy, the number who will get radiation therapy, the number who will get hormones. This example is part of a larger portion of the book on how prostate screening has not been proven to save lives, and likely even causes more harm than good. But the hospital marketer is only acting in a way that would be expected by an organization looking to maximize its profit. It has no incentive to provide proper care, but is actually incentivized to offer poor care so as to then make more money in “fixing” the outcomes of that poor care. These are not arguments against capitalism and the idol of the “free hand” as some may interpret it in general by Dr Brawley, but merely a description of an industry run amok which has negative consequences for every single one of us. Health care may have gone to the wolves. I would highly recommend you read this book to get a better understanding of the current health care environment.